Ski InLuxurious, prachtige 4000 vierkante voet huis SKI IN Super Bee Lift. Huis bestaat uit grote grote kamer met open haard en geluidsinstallatie en een hot tub op de patio. Perfect voor onderhoudend en ontspannen na een dag skiën! Home heeft twee romantische king master suites, elk met een open haard en openslaande deuren naar terras of balkon. Drie extra slaapkamers -1with een kingsize bed en 2 queen-size bedden en onderschuifbed bedden onder zorgen voor flexibiliteit. Geweldig voor de kinderen! Dit huis beschikt ook over een bovenverdieping studio 'appartement', compleet met kitchenette, bar, tv / videorecorder, bank (tweepersoons slaapbank), stapelbedden, open haard en een speeltafel. Huis is voorzien van een extra grote modder kamer, compleet met kaartenbakken voor ski-accessoires, evenals wasmachine en droger. Dit huis is perfect voor vakanties met meerdere gezinnen of zakelijke retraites! Excellent accommodations for our large group of 12 adults. House has everything you need on a vacation. Kitchen well stocked with basics plus more! On call shuttle made getting to and from slopes super easy. Easy walk to East Village and Super Bee Lift. Will definitely stay here again should we return to Copper. Beautiful, spacious and comfortable home in a convenient location. Definitely would go back and highly recommend. We were so happily surprised at how wonderful this house was for our family of 16 !! The open floor plan was great for keeping everyone engaged at all times. We did a lot of cooking and I couldn't get over how well the kitchen was stocked. It had 4 coffee machines ! We are not "black run" skiers but the shuttle on demand was so great. Any where in Copper accessible by just a text. The rooms were beyond comfortable. visiting the house prior to shopping because it comes stocked with so much you end up over buying. We were visiting over Christmas so the tree was a great touch. Would highly recommend this house. We are so thrilled that you enjoyed your stay so much! We strive to stock the house with the essentials in case you forget something! The house was designed to be a great gathering place for several families to enjoy. Each December we decorate the home for the holidays complete with a 12 ft Christmas tree to create very festive feel! We’d love to have you back in the future! We had a lovely time with family, plenty of space available! Such a nice surprise that holiday decorations were all in place, just lovely! Gorgeous house that was perfect for a large group. Fourteen of us descended upon this beautiful house at Copper Mountain for a wedding on September 15. We were astonished to find fully equipped bathrooms for each of the bedrooms, plenty of blankets and pillows, an amazing kitchen, and the bonus - the hot tub! Wedding guests who were not staying with us were green with envy. The few issues that we encountered were so minor that they are not worth mentioning. The owner was gracious and accommodating, and I would return here in a heartbeat! This was our first trip to the Rocky Mountains; we needed a house that could house several couples from different areas of the country for a family reunion. With 6 bedrooms, 6.5 baths, this house was perfect! Copper Mountain is a great ski resort area, and even though it was summer there was plenty to do. We (not everyone did everything listed) hiked, rafted, pontoon boated, took a gondola to the mountain top at Breckenridge, played golf (but miniature and true), raced go-karts and went horseback riding. We also took advantage of the Guitar Town Festival taking place in Center Village at the resort. 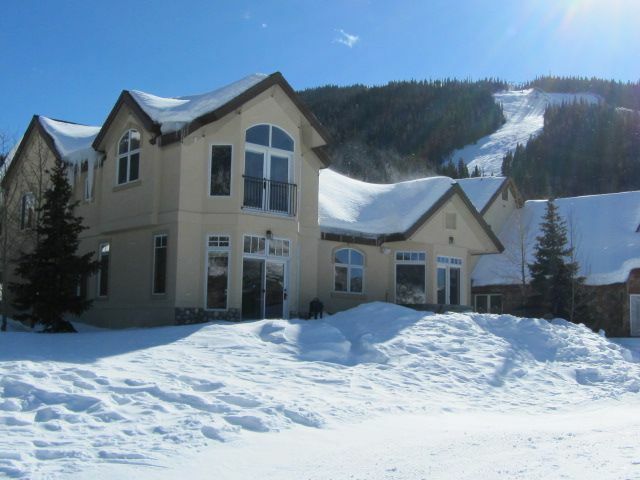 The house is a short walk to the free shuttle pick-up which travels around Copper Mountain on a regular schedule. What fun! This house is spectacular! Located right at the 10th tee of the golf course, it has an amazing view. We have stayed at vacation homes before, but this one is, hands down, the most well-equipped. There was everything you could possibly need from every size beverage glass to cooking utensil, extra linens, a large washer and dryer and trundle beds tucked under the beds in the upstairs bedrooms in case they were needed for extra guests. I can't think of anything I could have wanted that wasn't there. We had one minor problem when we arrived that the landlord took care of immediately. She checked that all things went well and was a joy to deal with before and during our stay. I highly recommend this location for your visit to Copper Mountain.